At first sight, yesterday’s session was quite boring – gold ended the session practically unchanged while silver and mining stocks were only a little higher. The USD Index was practically unchanged. But just because nothing happened in the market in terms of the daily closing prices, it doesn’t mean that we don’t have anything interesting to discuss. We do. There is a boomerang topic that just came back once again – the Commitment of Traders report for gold seems to be favoring higher gold prices as the current readings were seen at previous local bottoms. Are we going to see a CoT-driven rally shortly? We wouldn’t count on that. A few months ago – in late March – we discussed the silver CoT as the situation in it was critical (the “large speculator’s” position moved below 0) and was likely to trigger an explosive rally. At least that’s what gold promoters would have you believe. On March 26th, 2018, we wrote that the implications of the signal were unclear and thus that it was not a big deal. Silver’s daily closing price was $16.58. The silver chart that we included in that had a target of about $15.40. We admit, it took longer for this level to be reached than we had originally thought (we made profits on the sideways trading in the meantime, so it was not that bad), but after all, this price level was reached and there was no explosion in the price of silver, or gold. Before moving to mining stocks, we would like to reply to a few questions that we just received. Every now and then we are requested to comment on the CoT reports as they continue to be viewed as a very important tool in determining precious metals prices. Just as often, we explain that in our opinion, the usefulness of these reports is overestimated as there are many other indicators for PM prices that appear more useful in determining the precious metals’ direction, for instance the RSI. 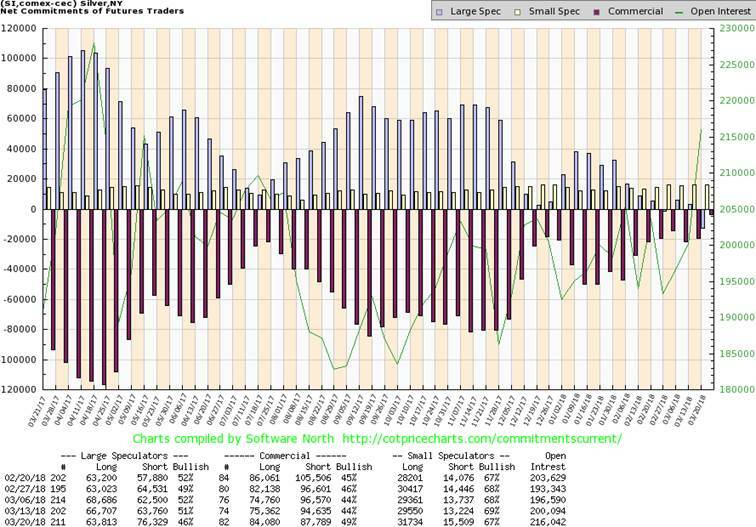 Let’s take the silver CoT as an example and let’s use Large Speculators as a proxy for the entire report’s data. What was the buy zone? Based on the 2007 – 2012 data, one might think that it’s the level of 20,000 contracts as that was when silver’s price reversed. But no – this level didn’t’ stop silver in 2012 and in the following years. So maybe the interesting level was about 5,000 contracts as the 2012 bottoms suggested. Nope – the amount decreased below it in mid-2013 and so did the price of silver. The number finally reached about 0 in 2013. “That must have been the true bottom” – the CoT followers stated. Oops – 5 years later and silver is still well below the level that it reached in mid-2013. It was about $20, so the white metal is currently more than $2 below it. By the way, did you notice how the analyses that discuss the CoT data are almost always focused on short or (in the best case) medium term? If you feature the big picture, you see how incoherent the implications are and why this tool should be used at best as something that confirms other types of analysis and not on a stand-alone basis. To be honest, the above paragraph is not entirely correct – the CoT analyses are usually not focused on any charts at all. Long-term CoT charts (like the one that we featured for silver) would put the comments into perspective and it would be clear that they are not that meaningful. The comments are about a given position in any part of the report that was reached, the differences between them (net position), or about the dynamics (commercials added crazy XYZ to their already huge position!) and they are often accompanied by comments on how big, small, or whatever the position is, or how remarkably fast or slow a given move in the levels of a given position is taking place. Whichever of the above is the case, it is said to be bullish. On one hand, the above may seem strange to those who are new to the precious metals market, and on the other hand, not blindly agreeing that CoT’s are bullish for gold and silver may appear outrageous to those, who think that gold will move much higher in the next few years. This way of thinking is indeed very specific, but is it still analysis? No. It’s an example of confirmation bias a.k.a. wishful thinking. We actually do think that gold and silver will soar in the coming years, but that doesn’t mean that we’ll say that everything about these markets is bullish. Whenever something is bearish, neutral, or unclear, we’ll call it exactly that. There are tons of factors that currently support lower precious metals prices in the next few months, and we will not just ignore them – we will take advantage of the upcoming slide, make money while precious metals decline (sometimes profiting on the corrective upswings like we did in early July) and then get back in the precious metals market at much lower prices and with much bigger capital. Why are we discussing all this? Because the positions shown in the gold CoT report are similar to what we saw in July 2017 and December 2017. Gold bottomed and rallied in July and December 2017, so the above chart seems bullish for the next few weeks. Naturally, a rally could follow, but it’s not likely to. Both mentioned cases are taken from the time when gold was trading sideways and the odds are that this stage is over. Consequently, the CoT values are not a tool that should be currently applied. When we wrote about the RSI several days ago we emphasized its usefulness during big rallies and during sideways trading and its uselessness in the case of medium-term declines. If you read that analysis, you probably already know what we’re going to say. If you didn’t read it – we encourage you to do so. We compared expecting the RSI to be useful during big declines to chopping a tree using a fork. Using CoT reports during big declines may be compared to chopping a tree using a spoon. It’s not the same as the RSI, but it’s in the same ballpark and it’s just as pointless to be using it when trying to take advantage of the big downswings. This goes for both taking advantage of the downswings by betting on lower PM prices and for simply waiting for great buying opportunities. Both mentioned cases – July 2017 and December 2017 were buying opportunities that were indicated by the RSI indicator. Last week we discussed it in detail how these signals work during upswings and during sideways trading and how they don’t work during declines. It’s the same with the CoT readings. We already quoted a sizable part of our previous analysis above, so we don’t want to put another big quote below, but combining the analysis that we did quote (about silver CoT) and our last week’s discussion of the RSI’s implications during big downswings makes it clear that the current “signal” from gold’s CoT is of very little meaning. You can hate it, you can scream “gold manipulation!”, and you can ignore it. But all this won’t change that the CoT report is most likely not going to help you during the big moves. It may even give you false signals leading to substantial losses and/or missed opportunities. Finally, since the above discussion may trigger emotional responses, we think a few things should be emphasized. Sir Isaac Newton said: Plato is my friend, Aristotle is my friend, but my greatest friend is truth. Paraphrasing the above, we can say: gold is our friend, silver is our friend, but our greatest friend is truth. We think that both metals will move much higher in the coming years. In particular, we are not perma-bears - we were bullish (in terms of long-term investments) on precious metals for years – until April 2013. We work for investors, not for gold/silver producers, or gold/silver sellers and our loyalty stays with the former. Therefore, we will not promote gold ownership (except as insurance) when we think that it’s going to move substantially lower and we are doing this for gold and silver investors (so that they can invest at better prices or profit from the decline), not against them. We are the precious metals investors’ true friend – the one that will tell you the harsh truth when things are bad if it’s likely to benefit you, instead of telling you sweet lies that may be pleasant to hear. Summing up, the outlook for the precious metals is extremely bearish for the following weeks and months, and even though there are some signs suggesting that a big rally is just around the corner, it’s not necessarily the case as these signs: gold’s CoT numbers and gold’s daily RSI are not particularly useful during big, medium-term declines. There is some strength in the PM market today, but it’s very unlikely to be a start of a really big upswing.